Play a few rounds in the stunning Cape Winelands amidst internationally renowned vineyards and award-winning restaurants and top it off with a three-day luxury safari in the wild private reserves adjacent to the Kruger National Park. In one week you can see the big five (lion, elephant, rhino, leopard and cape buffalo), perfect your golf swing and wine and dine at some of the best establishments in the world! 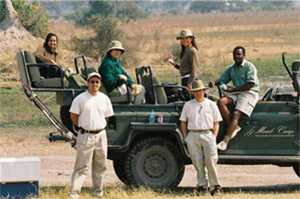 We work with trusted partners who are former PGA golfers and have personal relationships with all the top golf courses in South Africa, enabling us to create bespoke golfing experiences combined with top-notch safaris and other unique experiences for non-golfing members of the group. For the 'bucket list', few holes in the history of golf have generated as much interest globally as the The Extreme 19th hole. Accessible only by helicopter, with the tee set high up on the majestic Hanglip Mountain in the Waterberg and played to a green the shape of Africa some 400 metres below, the Extreme 19th is one of the most unique par 3s on the planet and is every golfer's experience of a lifetime. Golfing superstars as well as celebrities from the world of sport and entertainment have all tried and failed to make par on this hole. Be the first to score a 'hole-in-one' and claim the US$1 million prize on offer. Bordering the Kruger National Park, Leopard Creek is currently rated as the No 1, Golf Course in South Africa by Golf Digest. Gary Player had a vision of a perfect golf course – it should be friendly and enjoyable yet challenging and stimulating enough for the world’s top golfers. Designers worked closely with the Kruger National Park to ensure the design blends in with the natural surroundings and abundant beauty of the African bushveld. Situated between the picturesque towns of Franschhoek and Paarl in the Cape Winelands, Pearl Valley is surrounded by spectacular mountains, hillside vineyards and natural fynbos. Designed by the legendary Golden Bear, Jack Nicklaus, each hole on the pristine course is challenging with strategically set bunkers and fast greens. Clever design ensures a variety of conditions on the course, with all par-three’s and par-five’s playing in different directions. If you’re looking for one of the best par-fives in South Africa, you’ll find it on the fourth hole, where you’ll cross a river three times on your way to the green. Hugging the slopes of the Steenberg Mountains in the idyllic Constantia Valley in Cape Town, Steenberg Golf Course meanders its way through Steenberg's famous vineyards, pine forests and gentle waterways. Designed by renowned golf course architect Peter Matkovich, the course features four distinct areas: wetlands, parklands, Cape flats and fynbos. The course’s five different tees allow professionals and amateurs alike to enjoy their round of golf and the greens are reputed to be the best in Cape Town. Steenberg was voted number one in the 'Top 20 Foreign Golf Resorts 2012' by Condé Naste Traveler readers and sits in the number two spot worldwide. Overlooking the Indian Ocean from its perch atop the East Head of the Knysna Lagoon along the Garden Route, this multi-award-winning golf course is a sweeping spectacle of fairways and greens rolling through the pristine Southern Cape landscape. Reminiscent of Gleneagles in the Scottish Highlands and Pebble Beach on the Monterey coastline, Pezula’s championship links course offers golfers a challenging, truly five-star experience. If you’re looking for an unsurpassed golfing experience on one of South Africa’s most scenic and impressive links courses, then you must play a round at Pezula Golf Club.